Calling all teenagers—quit the moaning and start loving life! Don't be a cliché. Don't stay in your bedroom grunting and grumbling. How about getting motivated, energized and start making a difference?! 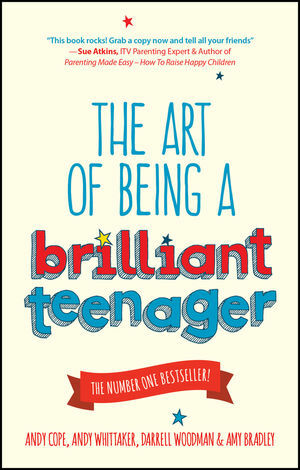 The Art of Being A Brilliant Teenager teaches you how to become your very best self—and how to figure out who that is, exactly. The bestselling authors of The Art of Being Brilliant and Be Brilliant Everyday are experts in the art of happiness and positive psychology and, with this new book, you'll find your way to becoming brilliant at school, work, and life in general. Stay cool under all the pressures you're facing, and plot a map for the future that takes you wherever it is you want to go. Become proactive, determined, successful and most importantly: happy! Andy Cope is a teacher, trainer, speaker and author. He is currently studying happiness, flourishing and positivity as part of a Loughborough University PhD thesis. Andy is a prolific and sought after speaker with an international audience, who speaks at business conferences as well as at over 300 schools in the last 2 years. He has written self-help books for adults and teenagers as well as penning Puffin's best-selling Spy Dog series. He has done numerous radio and TV appearances and runs a hugely successful '2%ers club', Britain's first and biggest association of happy people. Andy Whittaker is a trainer, best-selling author, frustrated comic, NLP trainer, and master of time line therapy. He co-wrote the best-selling book The Art of Being Brilliant with Andy Cope. He has delivered to companies as diverse as DHL, University of Nottingham, Smith & Nephew, Ginsters, IKEA, Pirelli and The National Trust.